Massimo Dallamano’s kid possession film Night Child is light on blood and gore, but heavy on mood and atmosphere. Michael, played by Richard Johnson, travels to an Italian village to film a documentary on diabolical art. 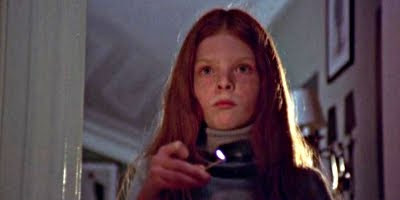 Feeling it may be a good remedy for her nervous breakdowns, Michael brings his daughter Emily along, played by Nicoletta Elmi from Deep Red and Demons, whose condition only worsens as she undergoes a dangerous transformation. One shouldn't expect to be intrigued by Night Child’s so-so narration, but rather the style and feel of the film, which owes a lot to the lovely Italian village setting and the mood enhancing score from Stelvio Cipriani. Elmi gives it her all and is terrific as the creepy kid being possessed by a ghost, and like in Lucio Fulci’s Zombie, Richard Johnson’s acting rises above the rest of the cast. Fans of Gothic Italian Horror shouldn’t miss this one.